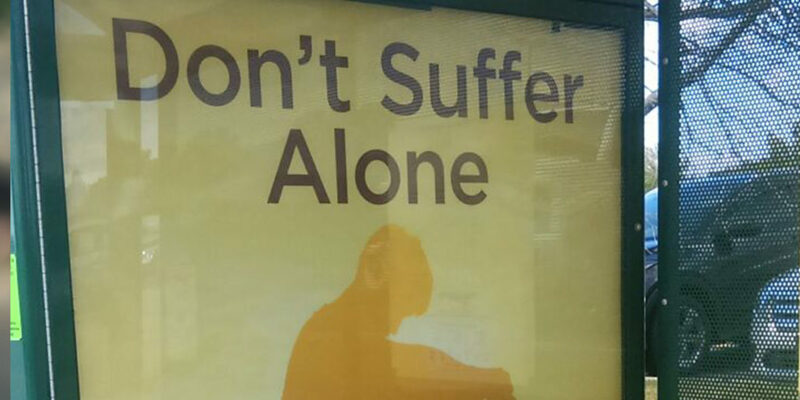 In 2018, Counseling & Recovery Services of Oklahoma created a series of shelter ads through Transit Advertising, Inc. to promote their “Don’t Suffer Alone” message. The powerful advertisement displayed a dark silhouette of an individual sitting on the ground with their head lowered on a bright background. The phrase, “Don’t Suffer Alone” was boldly displayed across the top of the ad with the call to action, “We can help” proceeded by contact information. One day, Counseling & Recovery Services of Oklahoma received a phone call from a client that had experienced trauma and was planning to end his life. The man shared that he had packed his belongings and was planning to drive to the state of his birth where he would end his life. 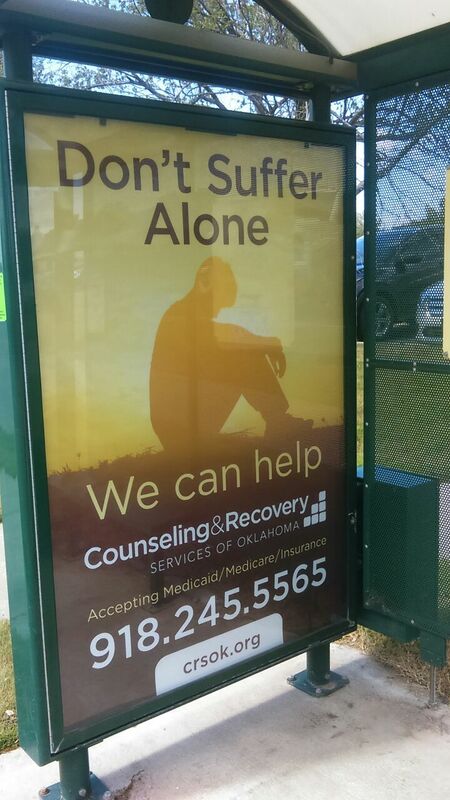 On his way out of Tulsa, the man saw the “Don’t Suffer Alone” bus shelter ad. Rather than proceeding with his plan, he decided to call the number on the advertisement and make an appointment as a last-ditch effort to find a reason to live. After his initial meeting, the man started a treatment plan and is on a path to recovery. Tulsa bus shelter advertisements receive up to 16K views per day! Shelter ads are located on bus shelter coverings. Drivers, pedestrians and bus riders see these ads. Transit Advertising, Inc.’s team helped Counseling & Recovery Services of Oklahoma create a plan to maximize ad exposure given their budget. The counseling center also did a great job of choosing impactful imagery and language that propels those in need to act. Together, the powerful advertisement design and plan for maximum exposure ensured a person in need received life-saving assistance. The bus shelter advertisement strategy was effective! Counseling & Recovery Services of Oklahoma’s advertising strategy with Transit Advertising, Inc. helped to save a life.